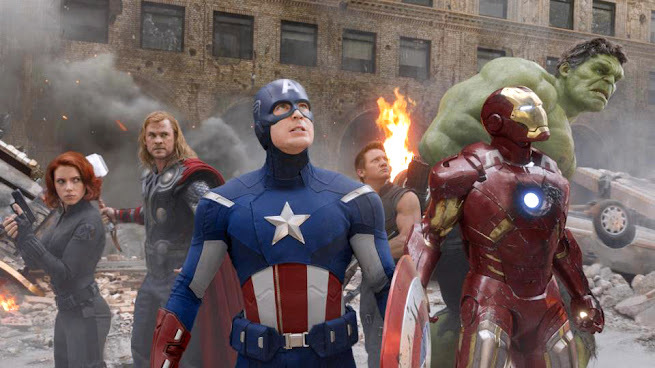 Over the weekend, the film The Avengers (2012) set a record. Besides having the highest opening weekend gross ($200 million), it is also the movie that set the new standard for superhero team movies. It's loud, boisterous and full of explosions, but still manages to take six characters and put them together in a way that doesn't feel contrived or forced. Like Richard Murdock's explanation of phone-hacking. The movie picks up where Thor and Captain America: The First Avenger left off. The military team S.H.I.E.L.D. has a box of unimaginable power called the Tesseract. Its stolen by Thor's brother Loki and, Nick Fury (Samuel L. Jackson), assembles a team of superheroes: man-out-of-time Steve "Captain America" Rogers (Chris Evans), flamboyant Tony "Iron Man" Stark (Robert Downey Jr.), the fugitive Bruce "Hulk" Banner (Mark Ruffalo), master archer Clint "Hawkeye" Barton (Jeremy Renner), Thor (Chris Hemsworth) the "demi-god" and super-spy Natasha "Black Widow" Romanov (Scarlett Johansson). The assembly of the team happens quickly and the rest of the film follows their attempts to stop Loki from releasing aliens on our world similar to Transformers: Dark of the Moon. There's lots of in-fighting like a superhero version of Jon and Kate plus Eight. Only fewer diapers. Writer director Joss Whedon's dialogue is crisp and fresh. He crafts some elaborate scenes that never get confusing or impossible. Unlike Jennifer Lopez' last video it feels believable. Even when a giant armored space whale is attacking the city you go along for the ride. Iron Man is pompous and brilliant. Hulk is funny and scary. Black widow is deadly and skilled. Captain America is noble and corny. Thor is regal and conflicted. Agent Coulson is stoic and brave. Hawkeye has a bow and arrow...honestly, his character was the one I had the hardest time buying. Considering how long it took him to shoot an arrow he should have looked like a burnt Eggo waffle after the first firefight. Overall, this is the biggest and most daring superhero movie ever made. The Avengers have assembled and we couldn't be happier. Is it perfect? No, but it's one of the top ten superheroes ever made and the number one superhero ensemble film ever made. It gets four stars. What did you think of The Avengers? Is it the biggest superhero movie ever made? I have never seen a superhero movie that was better than the Avengers. It's a top notch film. Michael, I agree. The Dark Knight is number one to me, but not by a huge margin. The Joker was cool. Jeremy, that is an awesome band name Man! Stan Lee's cameo was lacking in this film. Next time they should make him the head of SHIELD. DC needs to hang their head in shame for refusing to create a JLA movie. Alex a JLA movie is long overdue. I heard the big hold out was Nolan's batman and Superman rights trouble. Now that Nolan's leaving and the rights are free who knows? or the god... that he is! Hell to the yeah, this was one of the best superhero movies ever. Joss was the perfect director for this given his background with Marvel and it makes me wonder why they did not turn to him first. Now if only they would start having more female superhero flicks. Melissa, I totally agree Joss was perfect. I heard they approached him for one of the other movies, but can't remember which one. If theres a petition for a Black Widow movie sign me up! Btw which was the JLo video in question lol. I agree with Fernandes. That was one of the quickest reviews I have ever read. The film certainly is not perfect. I won't be seeing it again until its on Blu-ray. Film-book it's a shortie alright. I'll probably only see it once more before it hits Blu-Ray. I'm going to see The Hunger Games again in theater, not this. Really? The Hunger Games was better? Hard to believe. More involvement with the main character. The main character was actually in physical danger, unlike Thor, etc. Good point. Iron Man was the only one in any real threat. i go into a little more depth on hero danger in my review.